Title: The title of your task, which will be displayed on the board. Description: Description that use the Markdown syntax. Tags: The list of tags associated to tasks. 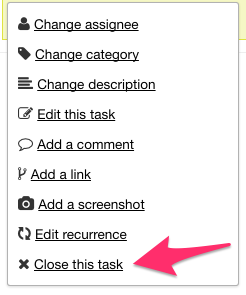 Create another task: Check this box if you want to create a similar task (some fields will be pre-filled). Color: Choose the color of the card. Assignee: The person that will work on the task. 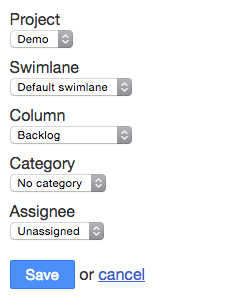 Category: Only one category can be assigned to a task (visible only if the projects have categories). Column: The column where the task will be created, your task will be positioned at the bottom. Priority: Task priority, the range can be defined in the project settings, default values are P0 to P3. Complexity: Used in agile project management (Scrum), the complexity or story points is a number that tells the team how hard the story is. Often, people use the Fibonacci series. Original Estimate: Estimation in hours to complete the task. Time Spent: Time spent working on the task. Start Date: This is a date time field. Due Date: Overdue tasks will have a red due date and upcoming due dates will be black on the board. Several date format are accepted in addition to the date picker. With the preview link, you can see the task description converted from the Markdown syntax. Go to the task view and choose Duplicate on the left. A new task will be created with the same properties as the original. Go to the task view and choose Duplicate to another project. Only projects where you are members will be shown in the drop-down. Before to copy the tasks, Kanboard will ask you the destination properties that are not common between the source and destination project. Go to the task view and choose Move to another project. Moving a task to another project work in the same way as the duplication, you have to choose the new properties of the task. When a task is closed, it is hidden from the board. However, you can always access to the list of closed tasks by using the query status:closed in any search form or simply choose Closed tasks from the filter drop-down. Note: When you close a task, all sub-tasks not completed will be changed to the status “Done”. This is also possible to link tasks across projects. Those labels can be changed in the application settings. Each movement of a task between columns is recorded in the database. To fit with the Kanban methodology, the recurring tasks are not based on a date but on board events. 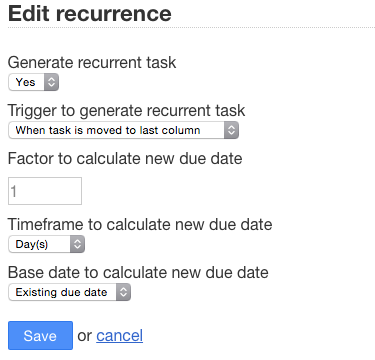 Go to the task view page or use the drop-down menu on the board, then select Edit recurrence. Due dates, if set on the current task, can be recalculated by a given factor of days, months or years. The base date for the calculation of the new due date can be either the existing due date, or the action date. You can copy and paste images directly in Kanboard to save time. These images are uploaded as attachments to the task. This is especially useful for taking screenshots to describe an issue for example. 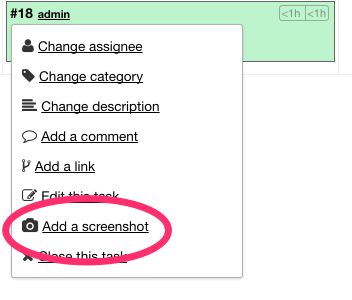 You can add screenshots directly from the board by clicking on the dropdown menu or in the task view page. There are also several third-party applications that can be used to take screenshots with annotations and shapes. 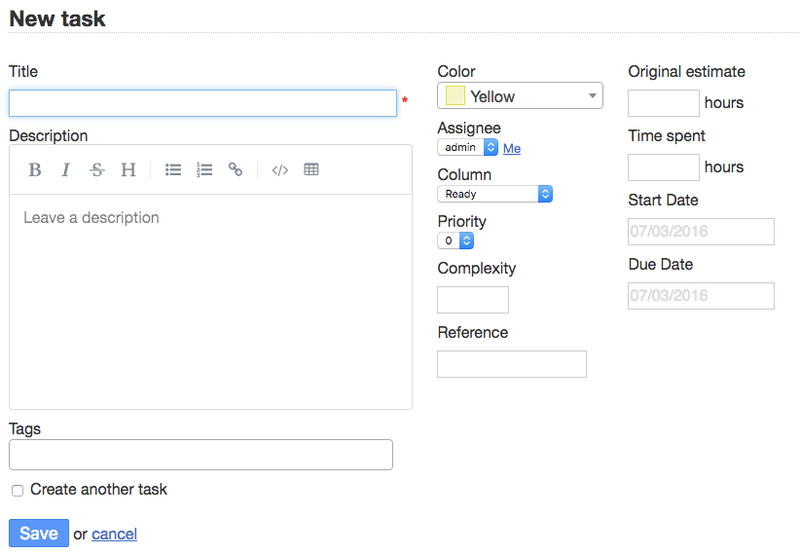 With Kanboard, you can associate one or many tags to a task. You can define tags globally for all projects or only for a specific project. The auto-completion form will show up to suggest available tags. All tags can be managed in the project settings. Each task has an analytics section available from the left menu in the task view. The lead time is the time between the task creation and the date of completion (task closed). The cycle time is the time between the start date and the date of completion. If the task is not closed the current time is used instead of the date of completion. If the start date is not specified, the cycle time is not calculated. Note: You can configure an automatic action to define the start date automatically when you move a task to the column of your choice. This chart shows the total time spent into each column for the task. The time spent is calculated until the task is closed.